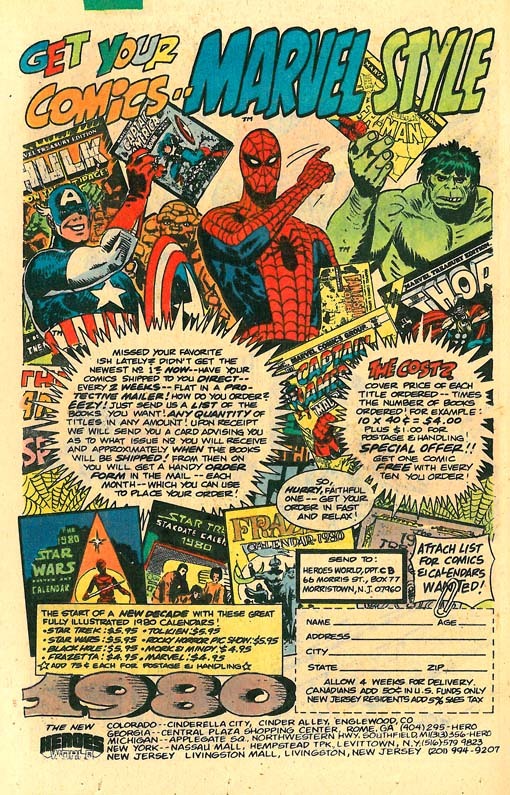 Heroes World was one of the most prolific advertisers in the pages of Marvel comics during the late 70s and early 80s. Marvel titles dated February 1980 featured not just one but two ads from Heroes World that varied depending on the release date. The first February ad was for Mego's Superhero Dolls (wouldn't they have been better off calling them action figures) and this second ad was for comics and calendars. With comics dated February 1980 likely hitting new stands in November 1979, I'm sure that 1980 calendars were flying off the shelves. One other cool thing about these ads that Gerry Turnbull pointed out is that the art is by the Kubert School. I wonder if any of this original art is kicking around out there?